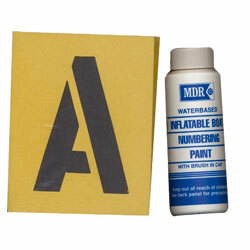 Letter / Number Height: 3"
MDR Inflatable Boat Stencil Kits are easy to use on Hypalon or PVC inflatable boat fabrics. Note: Do not use MEK or other solvents for preparation as they can affect the water based paint adhesion. Before painting, clean properly using Amazon's Inflatable Cleaner, MDR's Krazy Clean or a similar, non-solvent cleaner. Rinse thoroughly, and let totally dry, in the sun if possible. Sometimes, lightly roughing with extra-fine grit 000 sandpaper will help paints adhere. Other Useful Information can be found at MDR Fact Sheet for this product.